Developer website: Solbits Software Inc.
Is there a better alternative to Allocator? Is Allocator really the best app in Finance category? Will Allocator work good on macOS 10.13.4? 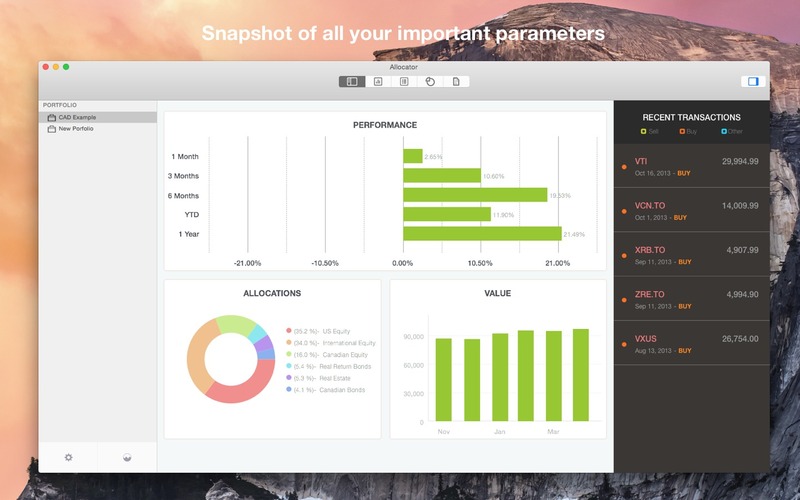 Allocator puts you in the driver's seat of your investment portfolio. Never have any doubt that your hard earned investments are getting you closer to the retirement you want. Allocator demystifies the endless numbers that keep you guessing about your financial path. Take control with Allocator. With Allocator, you can track portfolio performance, review and adjust your allocations, add transactions, and much more. Updated date picker to allow both direct entry and calendar popup. Allocator needs a review. Be the first to review this app and get the discussion started! Allocator needs a rating. Be the first to rate this app and get the discussion started! Quickly see how your current allocation aligns with your goals. Know precisely what to sell and buy to rebalance your portfolio. Looking to invest more? Know exactly what sectors you should be buying. >Generate easy to use reports for income, transactions and performance. Track your portfolio using both Time Weighted and Money Weighted Return Rates. No two investors are alike. With Allocator you choose your sectors. Do you want to track US Equities as a whole or do you want it broken down to include small cap and large cap? With Allocator it is your choice. Are you a Canadian that has investments in US Dollars? No problem -- Allocator will convert over 35 foreign currencies back to your base currency so you can get a true snap shot of your portfolio allocation breakdown. Report Generator - You can now generate reports for performance, transactions an income. Minor Bug fixes and several performance improvements.